WE CAN HELP YOU DOUBLE YOUR BUSINESS! Pinnacle Marketing Group has developed a marketing medium designed specifically for the medical and health care industry. We custom tailor a medical or health news journal specific to your practice and send it to a demographically selected customer base in you area. Not only do we design your journal to include practical and informative articles that relate directly to your medical procedures and treatments, we also highlight your background, expertise, facility attributes and staff. This custom format is an effective way to introduce your practice and medical expertise to new potential patients. Not only has this marketing medium been proven to be a very effective tool for adding new clients, but the format also allows you to market products and services that can generate significant ancillary revenue for your practice. In addition, we can also highlight specific offers and discounts. The Pinnacle Marketing Group Medical News Journal strategy has taken the latest in marketing meta-analysis to maximize the effectiveness of direct mail campaigns. You might have experienced less than satisfactory results from previous direct mail endeavors, since past research has shown that 60% of mail is discarded with a quick glance as “junk mail”. Typically direct mail would be designed as an offer or branding piece with only minimal information about the practice and a few bullet points. Potential patients are unable to garner any real information about the practice or the value of the services they provide from traditional direct mail. Our exclusive News Journal strategy has taken the latest in marketing meta-analysis to maximize the effectiveness of direct mail campaigns. You might have experienced less than satisfactory results from previous direct mail endeavors since past research has shown that 60% of mail is discarded with a quick glance as “junk mail”. Typically direct mail would be designed as an offer or branding piece with only minimal information about the practice and a few bullet points. Potential patients are unable to garner any real information about the practice and the value of the services they provide from traditional direct mail. This is why we have developed the News Journal format. Instantly your marketing piece becomes of interest and it speaks to the number one concern across most demographic profiles – their health. This is no longer considered a “junk mail” piece, but a medical journal that speaks to specific and relevant health issues. By providing article based explanations, procedural options and philosophies the reader is engaged and informed. These days it seems like every company claims to have the next best thing when it comes to marketing. At Pinnacle Medical Marketing, we know we have something special. Our newsletter campaign can easily pay for itself within the first few new patients that your practice receives. Our clients have been getting amazing results and we feel the statistics speak for themselves. Measure the effectiveness of your newsletter campaigns in “real-time” with our advanced call tracking. Our newsletters are given a unique phone number that is tracked and recorded. The unique phone number is forwarded directly to your office number so it’s transparent to your potential patients. When the call has ended, you will receive an email that includes a recording of the call. If the call is missed, you will receive a missed call email notification the second the caller hangs up. So you will never miss a call again! There are numerous companies that create and mail direct mail postcards, however no one offers the value that we provide. Our newsletter is 6x times larger than the typical direct mail postcard and traditionally it costs the same or within pennies of the cost of the average postcard. This allows you the space to advertise your practice’s products, services and promotions, resulting in an educated patient that is already sold on your practice before they contact your office. 6X LARGER THAN TRADITIONAL POSTCARDS FOR ONLY PENNIES MORE! 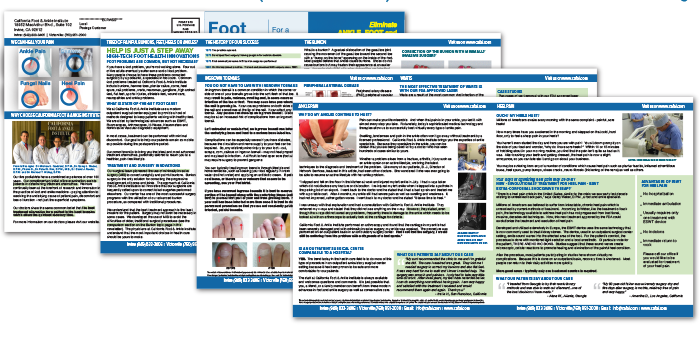 Our medical newsletter is available in 3 impactful formats; tri-fold, 8-pages and 12-pages. The format you choose largely depends on the amount of content you want to include in your newsletter. The prices below include postage. An initial setup and design fee is charged on the initial order, the pricing varies on whether the piece is semi-custom or fully custom, see below. Includes the initial design, layout, setup and 3 rounds of edits/revisions. Additional revisions >3 will be billed at $90/hour. 1. Newsletter template is customized to practice, practice provides all edited copy/text for the newsletter. 2. Newsletter template is customized to practice, Pinnacle Medical Marketing develops copy/text for the newsletter.